MORE than 200 people enjoyed an evening of classical music in aid of the Music Fund for Cuba in March. 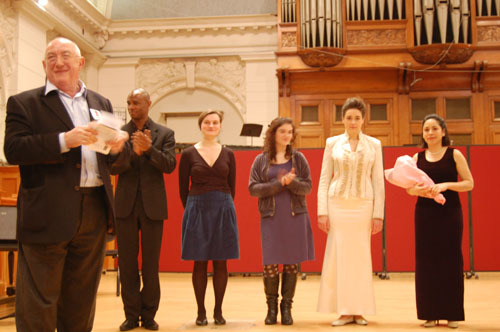 Young Cuban and European musicians performed - for free - at the Royal College of Music (RCM), in London, in March. Cuban pianist, Eralys Fernández Méndez, who is studying at the RCM, organised the concert, which included moving performances by Eralys herself, soprano Chloe Beecham and Ahmed Dickinson on guitar, among others. Guest speaker, Silvia Blanca Nogales, cultural secretary of the Cuban Embassy, said: “The economic and social revolutions that took part in Cuba were accompanied by a cultural revolution that promoted the importance of the arts and has striven to make them accessible to all. “Now Cuban art is gaining worldwide recognition. Michael Seifert, trustee of Music Fund for Cuba, said: “What moved me so much was the absolute simplicity and sincerity of each of the talented performers. It was clearly from the heart. “The Music Fund was founded in honour of Kirsty McColl and I am proud that her mother Jean is here tonight. Kirsty was a very talented and principled woman and the fund is testimony to her great spirit and love for the people of Cuba. A mix of classical and traditional European and Cuban music featured in the programme. The opening piece-Schickardt’s La Folia, was performed by Eralys on harpsichord, Iva Lokajickova and Rosa Camps on recorder and Electra Miliadou on cello. It was followed by Ahmed Dickinson performing Eduardo Martin’s De la Rumba Son and Mauel Ponce’s Sonatina Merifional. Eralys performed three more classical European pieces and two by a Cuban composer, closing the performance accompanied by soprano Chloe Beecham perfoming three Cuban songs. The Royal College of Music provided the venue free of charge. Robert Miller, director of the Music Fund for Cuba, said: “To date £30,000 of equipment has been sent by the fund to Cuba. The fund has also paid for the publication of books for Cuban teachers to use across the island.